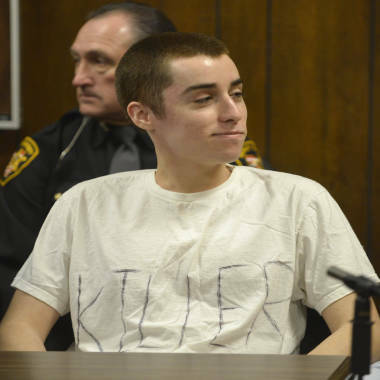 T.J. Lane unbuttons his shirt during sentencing Tuesday in Chardon, Ohio. Lane's sister, Sadie, who was in Chardon High School's cafeteria when her brother opened fire, also spoke on Tuesday, talking to reporters outside of the courthouse after the sentencing. "The brother in the courtroom and that did this is not the brother I knew," she said, offering her condolences to victims' families. She described the moment she learned from a police officer who the shooter was last February. “Along with other students, I heard the gunshots and screams, ran for my life, ducked under tables, hid in the teachers’ lounge, not knowing who the shooter was,” Sadie Lane said. "When those words hit me, I shook and cried and denied that all this could be true." She said she hoped for some good to come from the situation. "It may be hard for some to understand, but I love my brother, and I hope he can touch other lives in a positive way," she said.